Undoubtedly the highlight of the month was the Scottish dinner. Over 160 people attended a lively gathering at the Signet Library in Edinburgh. The toast to the guests was proposed by our Honorary Freeman – Lord Robertson of Port Ellen. A fantastic speech, I think he has had a bit of practice over the years. The guest speaker was Finlay Calder, former Captain of the British & Irish Lions. The Stirrup Cup lasted well into the night and people seemed to go home with smiles on their faces. This month has seen a piece of history take place for our Company. Honorary Freeman, Vincent Keaveny, became the Aldermanic Sheriff of the City of London. 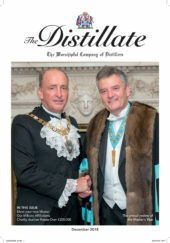 The Distillers have not had a Sheriff of the City of London for over 50 years and if Vincent continues to progress he may well be Lord Mayor in a few years’ time, the first Distiller for over 150 years. I first attended the presentation of his shrieval chain, which includes the Distillers crest in his badge. Then I was privileged to be one of his six supporters at the Admission of Sheriffs ceremony at Guildhall, which was followed by a sumptuous Sheriffs’ Breakfast. On a more sombre note, many Distillers attended the funeral of Court Assistant Chris Parker down in Surrey. Chris was past Chairman of the Industry Committee and the founder of the Gin Guild. He was always great fun with a wise head on him and will be sorely missed. I also attended a World War One exhibition by the London Scottish Regiment. Again a reminder of how many laid down their lives for this country in the Great War. The War Memorial lists nearly 1,500 men, a terrible loss for one regiment. Finally I attended the Glass Sellers’ dinner hosted by their Master John Poulten. As a fellow Essex man there was a definite Essex feel to it. The guest speaker was the Deputy Lord Lieutenant of Essex and Sheriff Neil Redcliffe and his wife Emma both hail from the County.